If you think your Alphabet District or historic property may be eligible for Special Assessment please feel free to contact us as a resource. We personally added the William L. Brewster and the Robert Hall Houses to the program so have experience you can lean on. The State Historic Preservation Office (SHPO) is a part of Oregon Parks and Recreation Department. SHPO manages the Special Assessment program, otherwise known as the Historic Tax Freeze. In 2009, Senate Bill 192 (summary pertaining to SHPO) did away with the “historic open house” for all properties. Properties listed in the program prior to SB 192 are specially assessed for 15 years. Newly listed properties receive the benefit for ten years. As of July 2009, there were 539 properties listed statewide. Properties inside the boundary of a historic district may be eligible if they are considered “contributing properties” to the district. 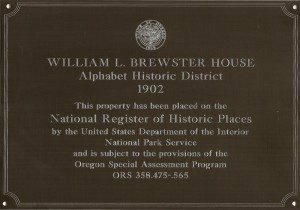 Portlandmaps lists 440 contributing properties and an additional 65 Individual National Register Resources in the Historic Alphabet District. There are 223 noncontributing properties and nine Portland Historic Landmarks. The oldest properties, ten of them, were built in 1880. The National Historic Register of Historic Places reports the area is 1569 acres and contains 478 buildings.